Dr. Richard Mayeux is the Gertrude H. Sergievsky Professor of Neurology, Psychiatry and Epidemiology, chair of the Department of Neurology at Columbia University College of Physicians and Surgeons, and Neurologist-in-Chief at NewYork-Presbyterian/Columbia University Medical Center. Dr. Mayeux is also director of the Gertrude H. Sergievsky Center, a center devoted to the epidemiologic investigation of neurological diseases, and co-director of the Taub Institute for Research on Alzheimer's Disease and the Aging Brain at Columbia University Medical Center. Dr. Mayeux graduated with distinction from the University of Oklahoma School of Health Sciences and trained in Internal Medicine at the Boston City Hospital and in Neurology at the Columbia Presbyterian Medical Center in New York. He completed a fellowship in the study of disorders of behavior, language, and cognition with the late D.Frank Benson in Boston. Dr. Mayeux completed graduate work in epidemiology at the Columbia University Mailman School of Public Health. Dr. Mayeux has led a multidisciplinary, population-based investigation of Alzheimer's disease and related disorders known as the Washington Heights-Inwood Community Aging Project (WHICAP) since 1989. Utilizing this WHICAP population, he and his colleagues were among the first to integrate genetic risk factors and epidemiological principles in an attempt to identify biological markers of susceptibility to degenerative diseases of the aging nervous system. He has been the author of over 350 papers, chapters, and books dealing with various aspects of Alzheimer's disease and other degenerative diseases of the aging brain. Dr. Mayeux has been the Robert Aird Visiting Professor at the University of California at San Francisco, the Emanuel Goldberg Visiting Professor at the University of Rochester, and the J.L. Silversides Visiting Professor at the University of Toronto. He was the recipient of the Columbia University Dean's Distinguished Clinical Scientist Award, and received the Rita Hayworth Award from the Alzheimer's Association. Dr. Mayeux is a fellow of the American Academy of Neurology and the New York Academy of Science, a member of the American Neurological Association and the Association of American Physicians. He is also a member of the Association for Research in Nervous and Mental Disease, the Society for Epidemiologic Research, and the Society for Neuroscience. He has served as a member of the Aging Review and the Epidemiology of Chronic Disorders Committees for the National Institutes of Health and the Medical and Scientific Advisory Board for the Alzheimer's Association. In 2001, he was elected to the Institute of Medicine of the National Academies. 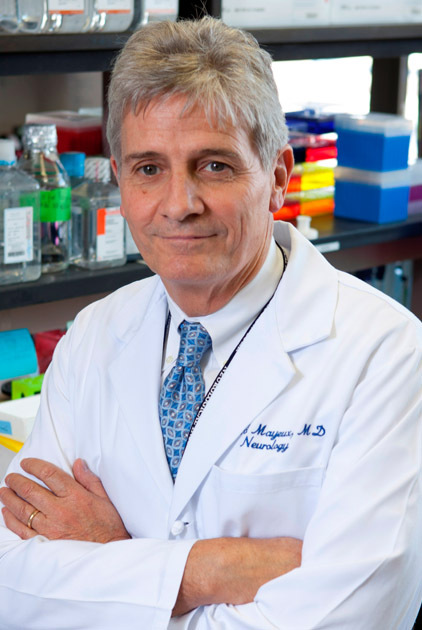 He has received the 2007 Potamkin Prize from the American Academy of Neurology, the 2008 John Stearns Award for Lifetime Achievement in Medicine from the New York Academy of Medicine, and the 2009 Henry Wisniewski Lifetime Achievement Award in Alzheimer's Disease Research from the Alzheimer's Association. Dr. Mayeux has led an epidemiological investigation of Alzheimer's disease and related conditions known as the Washington Heights-Inwood Community Aging Project over a period of 18 years. He studies the rates and risk factors for Alzheimer' disease among elderly of mainly African-American and Caribbean Hispanic descent. Dr. Mayeux also directs a genetic study of Alzheimer's disease in Caribbean Hispanic families. He has completed two full genome-wide scans in these families and is working to fine map regions of interest. He recently identified genetic variants in the sortilin-related receptor, SORL1, related to Alzheimer's disease. Dr. Mayeux is the coordinating investigator for the National Institute on Aging Late Onset Alzheimer's Disease Family Study. This study began in 2002 with the goal of identifying 1,000 families multiply affected by Alzheimer's disease. Most recently, he is the lead investigator in a collaborative study of families that display exceptional survival and longevity.